Dark hardwood floors in a modern kitchen. 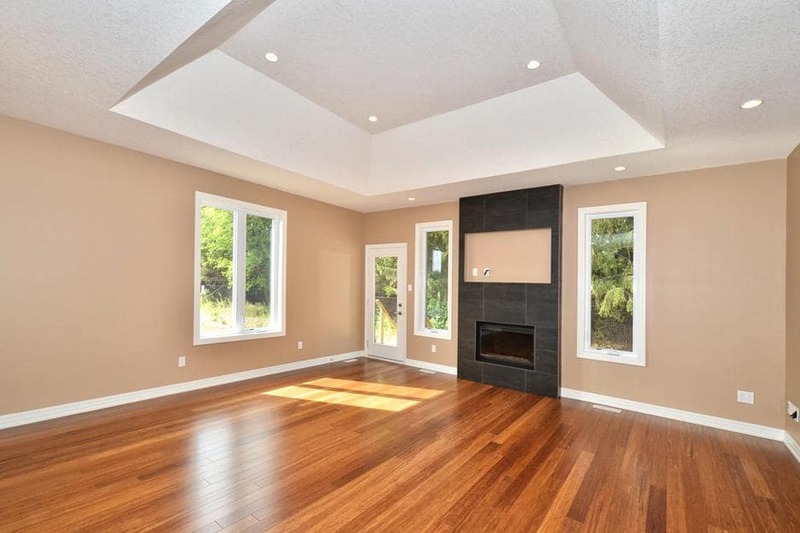 A hardwood flooring installation or wood floor refinishing project in London Ontario. 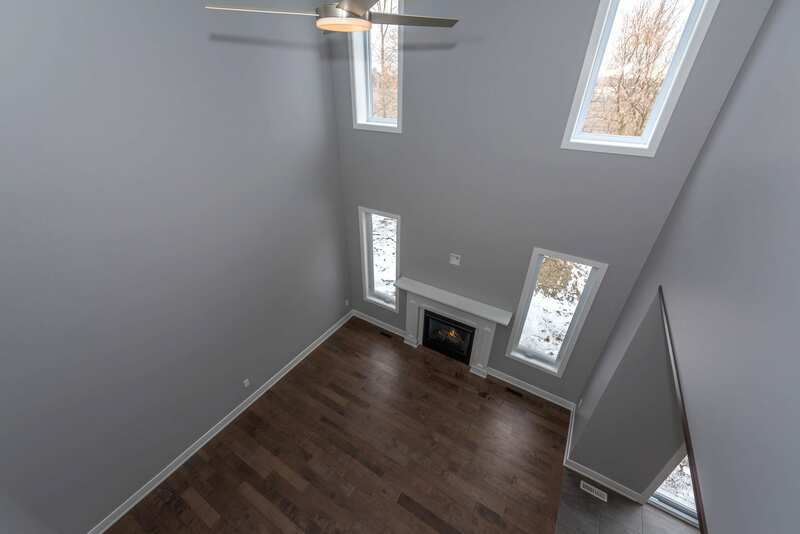 Dark hardwood flooring in new modern home, light grey walls, and a fireplace. 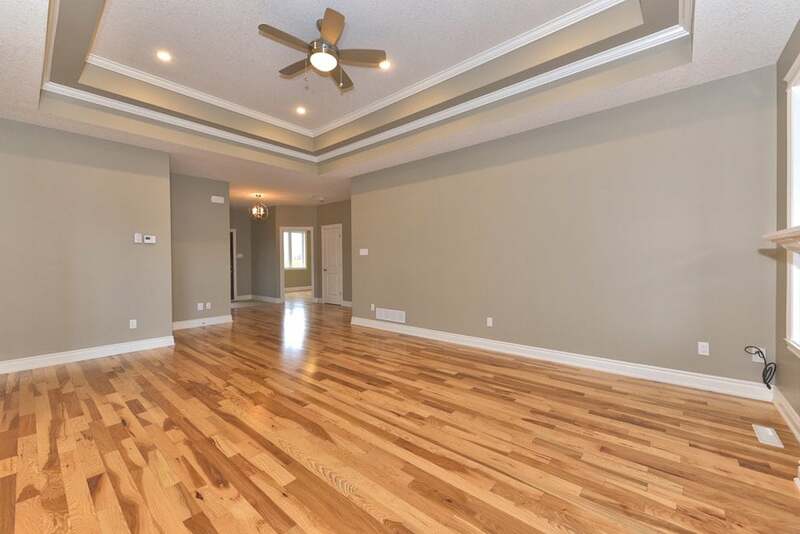 A hardwood flooring installation project in London Ontario. 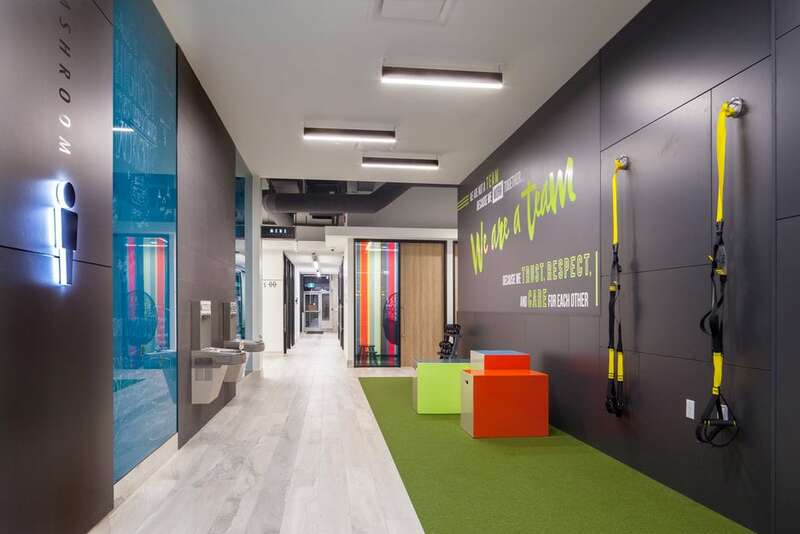 A grey hardwood flooring (and turf) installation at a fitness gym offices in Ontario. 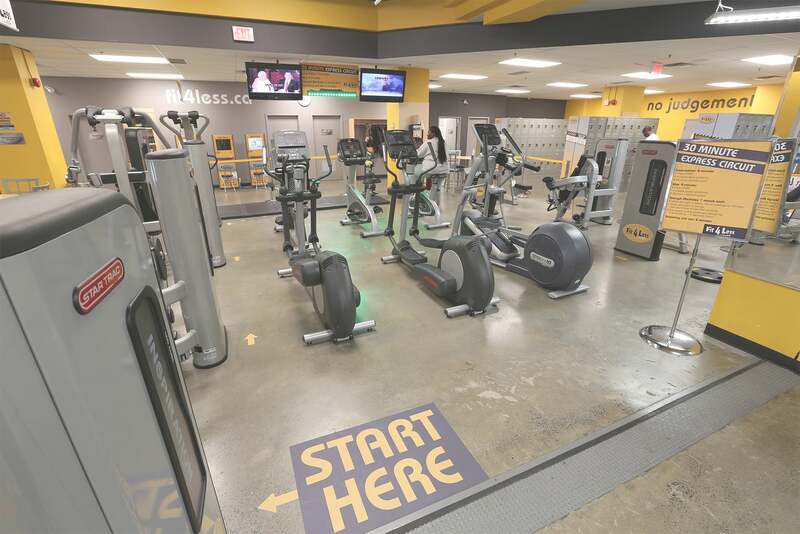 Green turf, grey solid or engineered hardwood floor, suspension trainers, water fountains. 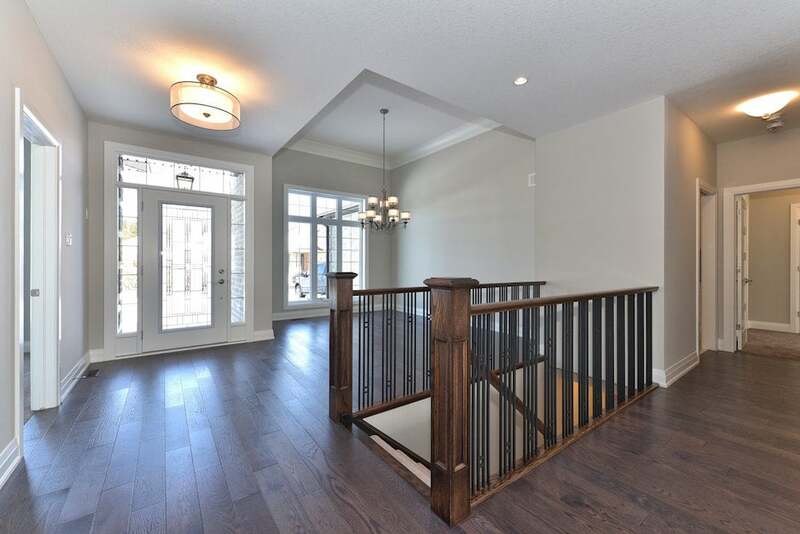 Dark hardwood flooring and traditional wood staircase leading to lower floor. New home entrance hallway. A hardwood flooring installation in London Ontario. 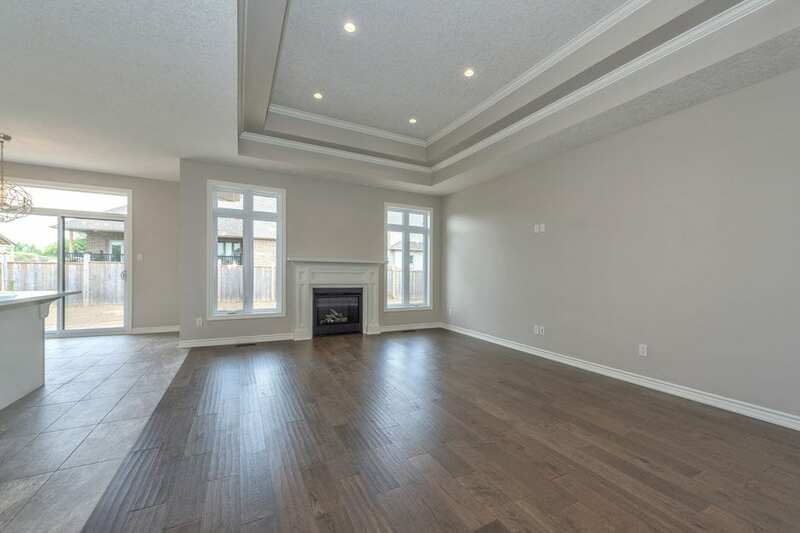 Hardwood floors in a large room, with large bright windows & grey walls. A hardwood flooring installation in London Ontario. A hardwood flooring installation in London Ontario. 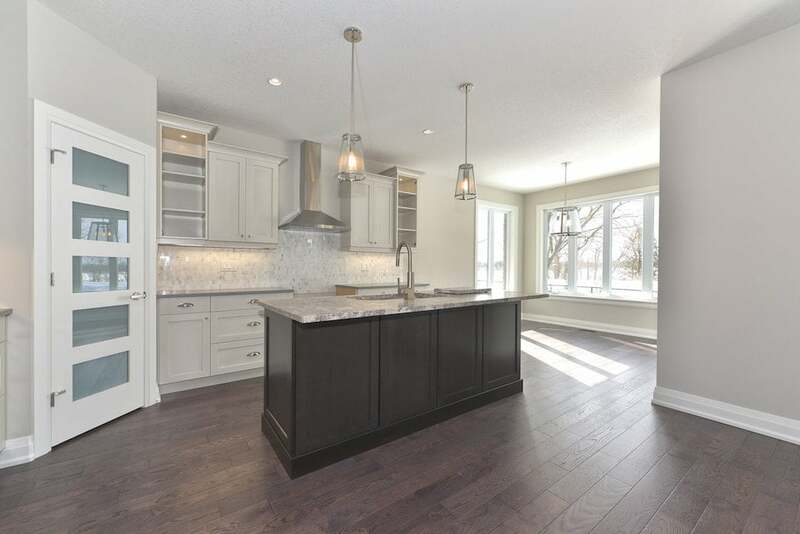 Dark hardwood flooring and grey-brown hardwood island in a modern kitchen. Custom hardwood flooring installation. 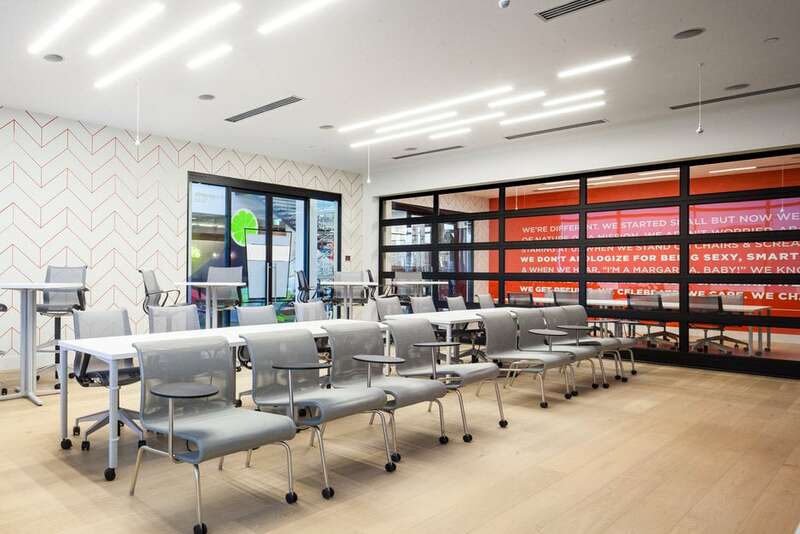 A computer room with natural light-coloured hardwood floor at a gym office space at Fit4Less in Ontario. Also in the photo: motivational message in white on loud orange wall. Hardwood flooring installation or wood floor finishing project in a large commercial / industrial space in the saltmine in Goderich, Ontario. A man at work walking on light hardwood floor. Close up of finished hardwood floors. 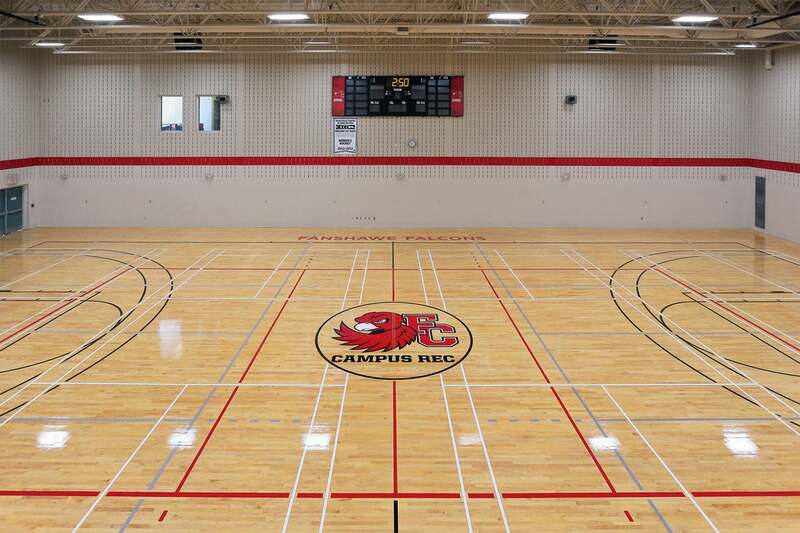 Raw hardwood floor installation and wood floor finishing project in a large commercial / industrial space in Ontario. Hardwood flooring installation. A computer room with natural light-coloured hardwood floor at a space at Fit4Less in Ontario. 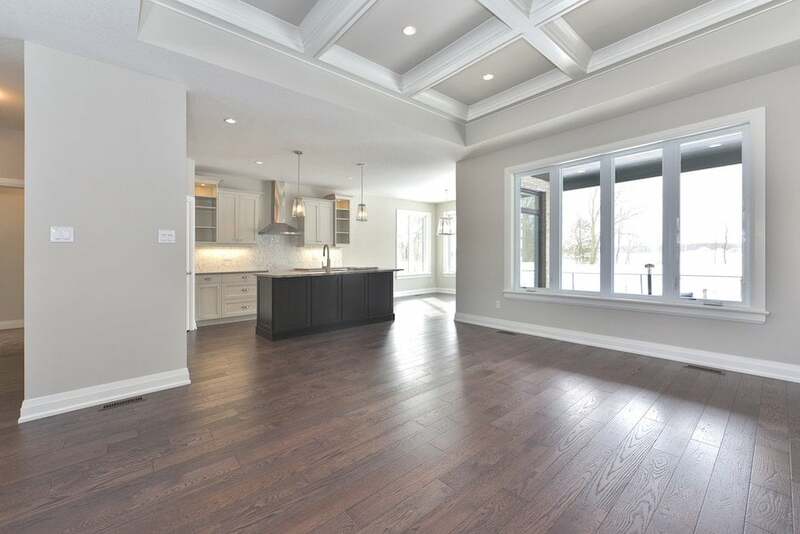 A hardwood flooring installation project: walnut stained solid hardwood floor or engineered hardwood floor with white baseboards in an open concept hardwood floored living, tiled dining and kitchen space. 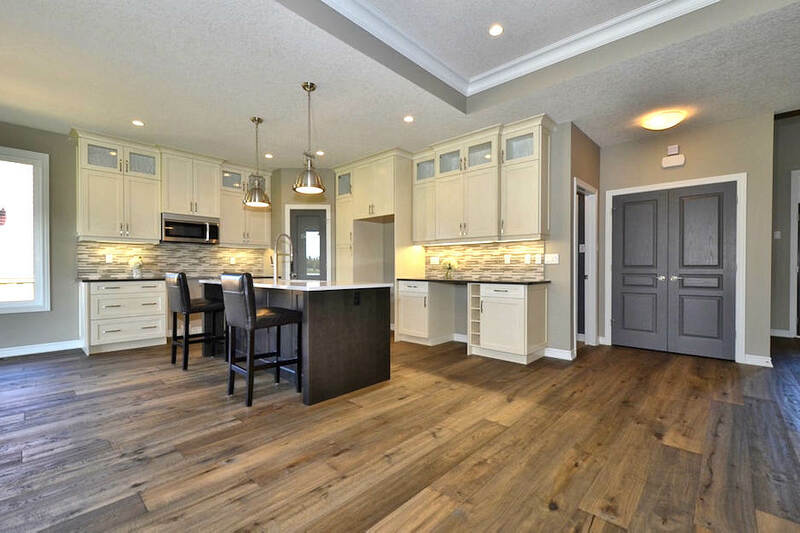 A hardwood flooring installation project: walnut stained solid hardwood floor or engineered hardwood floor with white baseboards in an open concept hardwood floored dining and tiled kitchen. 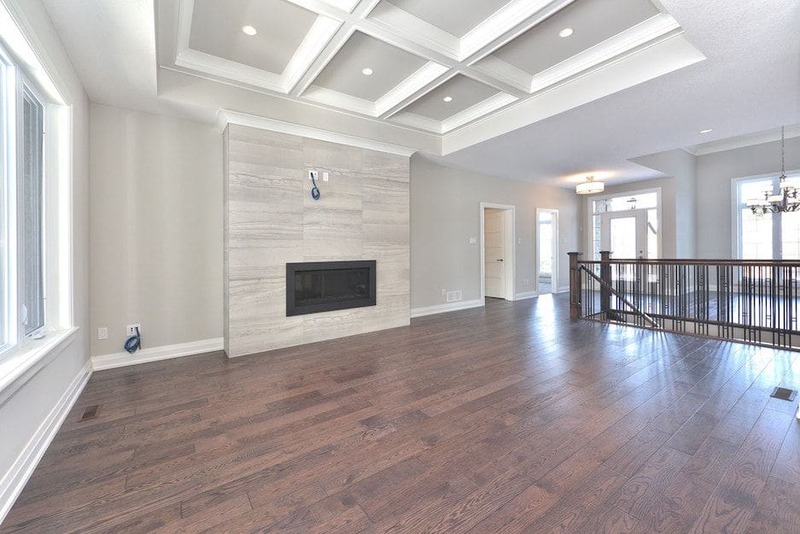 An Ontario hardwood flooring installation project: walnut stained solid hardwood floor or engineered hardwood floor in an open concept space with a fireplace. A grey hardwood flooring, hardwood stairs, and turf installation at a fitness gym offices in London Ontario. 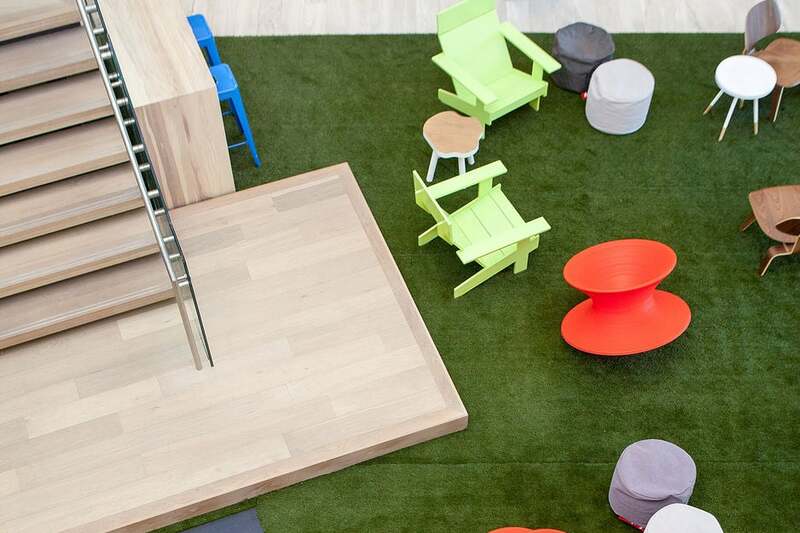 Grey hardwood floor platform and matching stairs, green turf floor lounge space with colourful recliners and puff seats. A grey hardwood flooring, hardwood stairs, stone slab and green turf installation at a fitness gym offices in London Ontario. 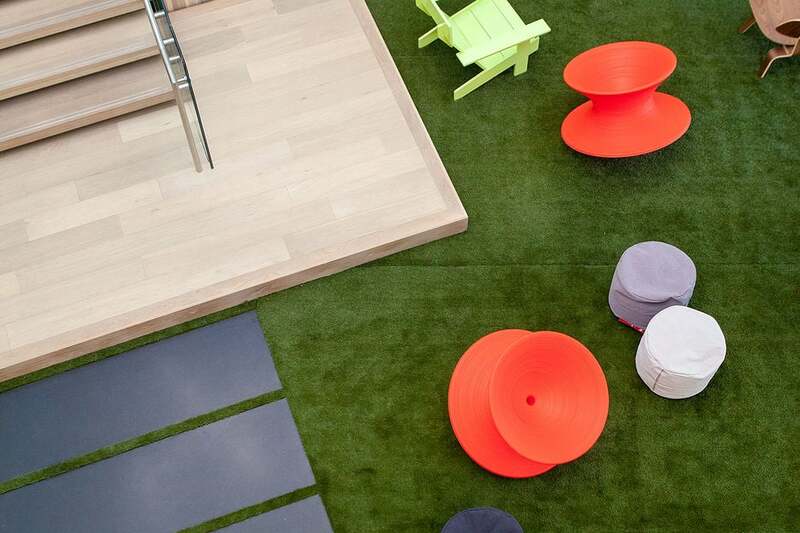 Grey hardwood floor platform and matching stairs, green turf floored relax lounge space with lawn chairs, puff seats and recliners. Wood floor refinishing project. 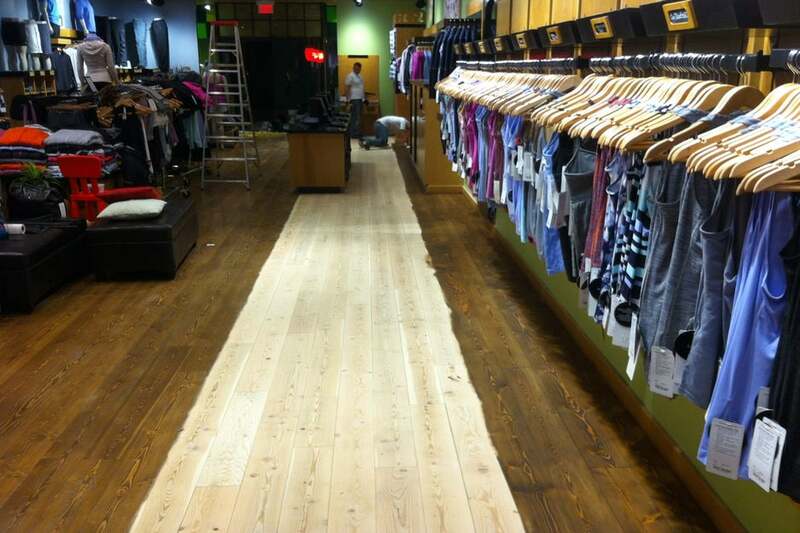 Hardwood sanding, staining and refinishing at a commercial space, Lululemon store in London Ontario. Wood floor refinishing project. Hardwood sanding and refinishing. 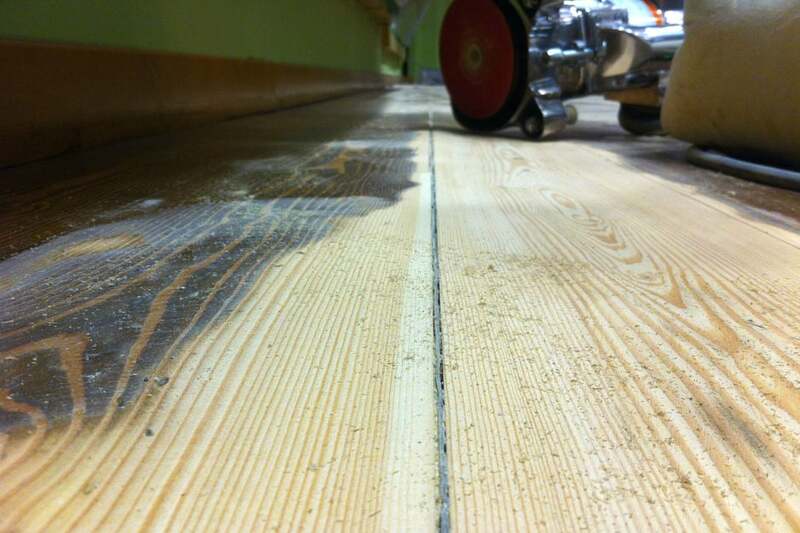 A hardwood flooring restoration project in a commercial space in London Ontario. 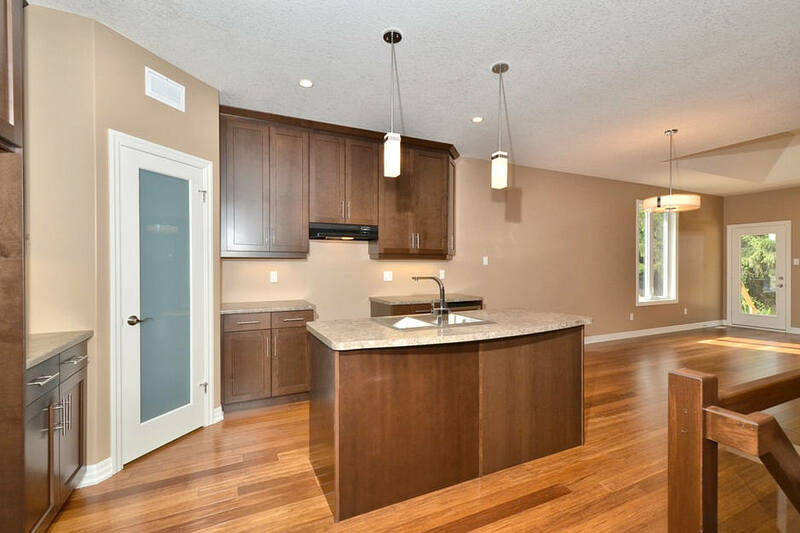 A hardwood flooring installation in a modern kitchen with medium-brown wood island with dark hardwood base. 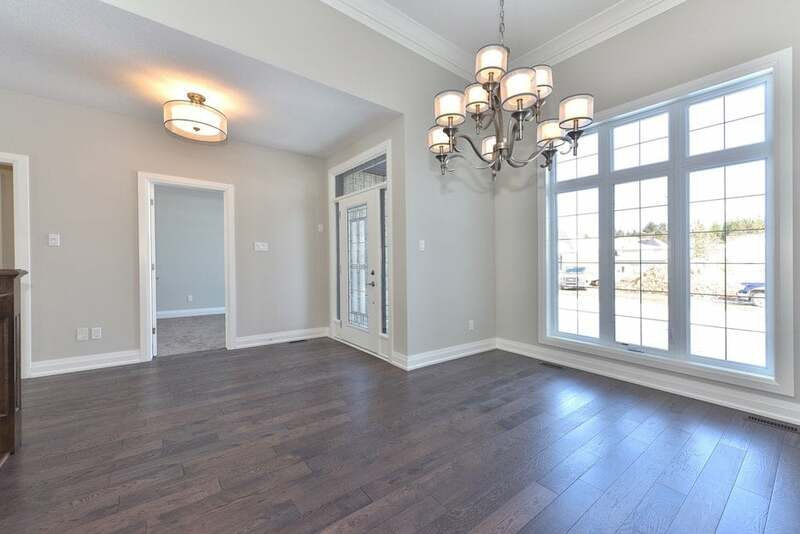 Dark hardwood floors in an open concept living room with a bright chandelier. A hardwood flooring installation in Ontario. 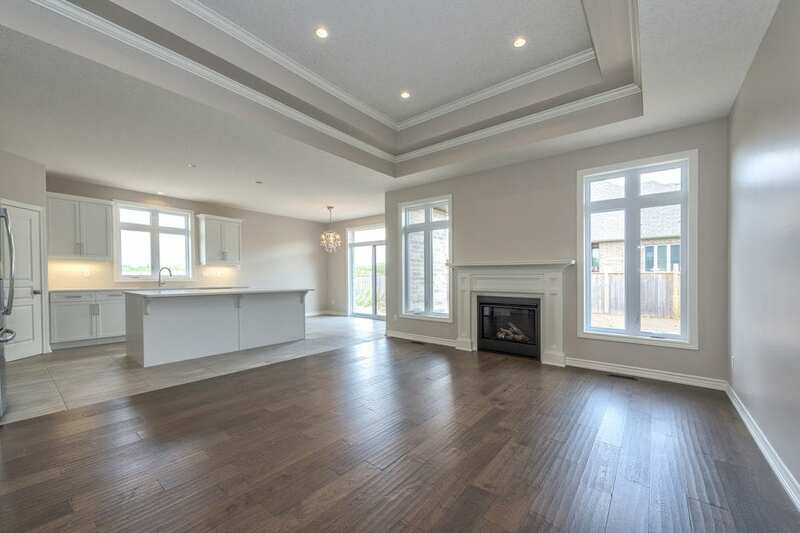 Dark hardwood floors in an open concept living room. 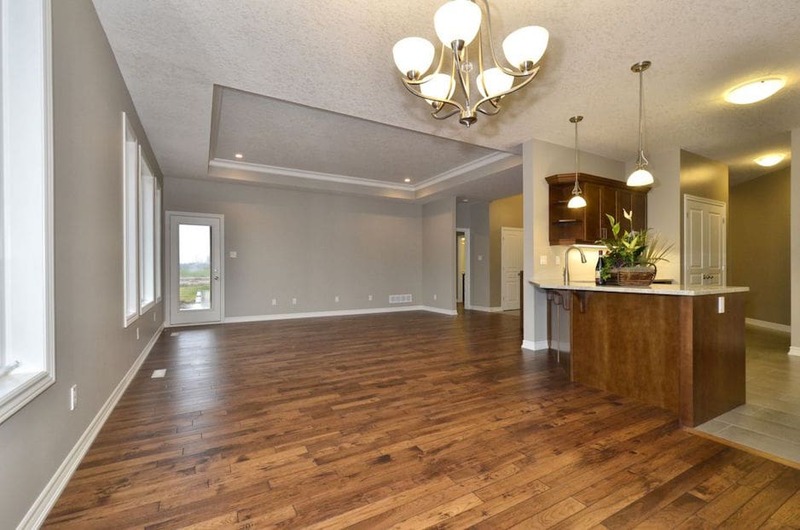 A hardwood flooring installation in Ontario. Hardwood flooring with a very intricate compass rose design with light, medium and dark wood elements composed together. A meticulously executed work of hardwood art. Part of a flooring project in London Ontario. A close up. 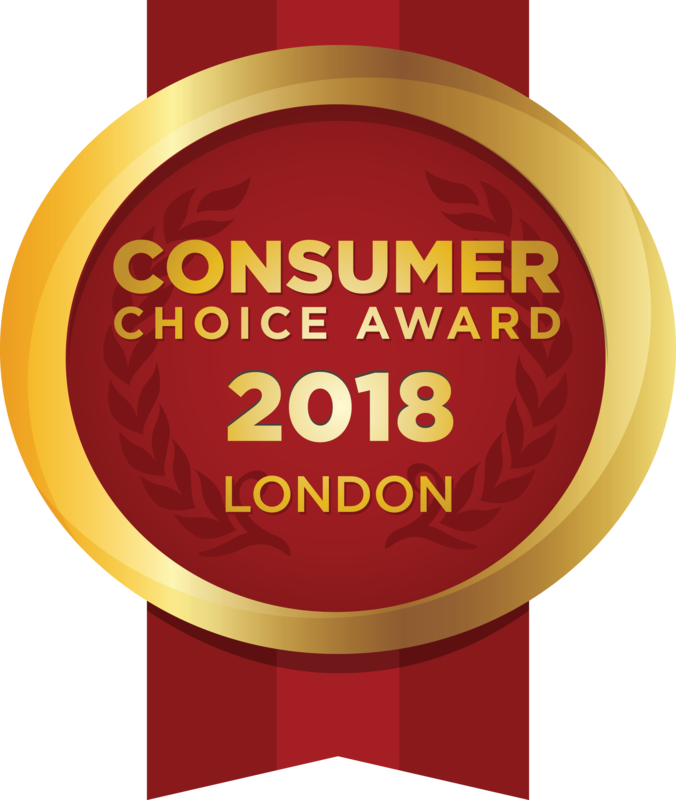 Hardwood flooring with a very intricate circular compass rose design with light, medium and dark wood elements meticulously cut and composed together. A work of hardwood art. Part of a Flatout flooring project in London Ontario. 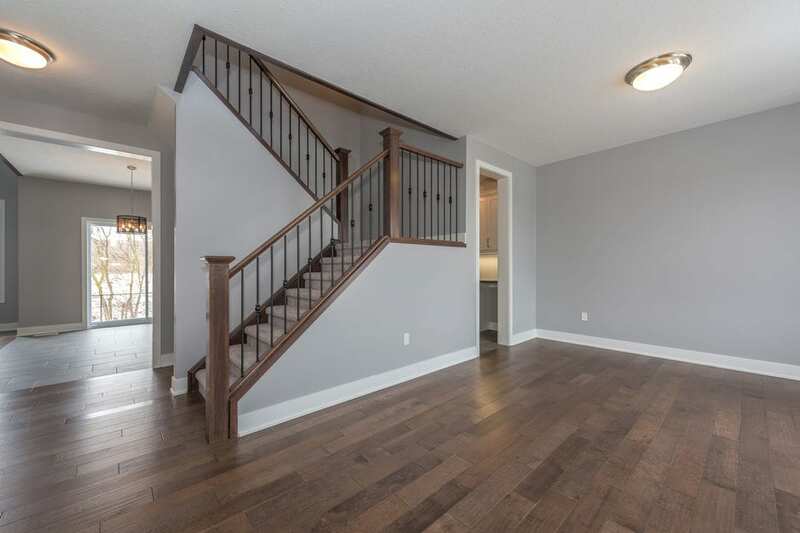 A London Ontario hardwood flooring installation project: stained solid or engineered hardwood floor, wood and stain-matched with staircase railings and columns, in an open living room. 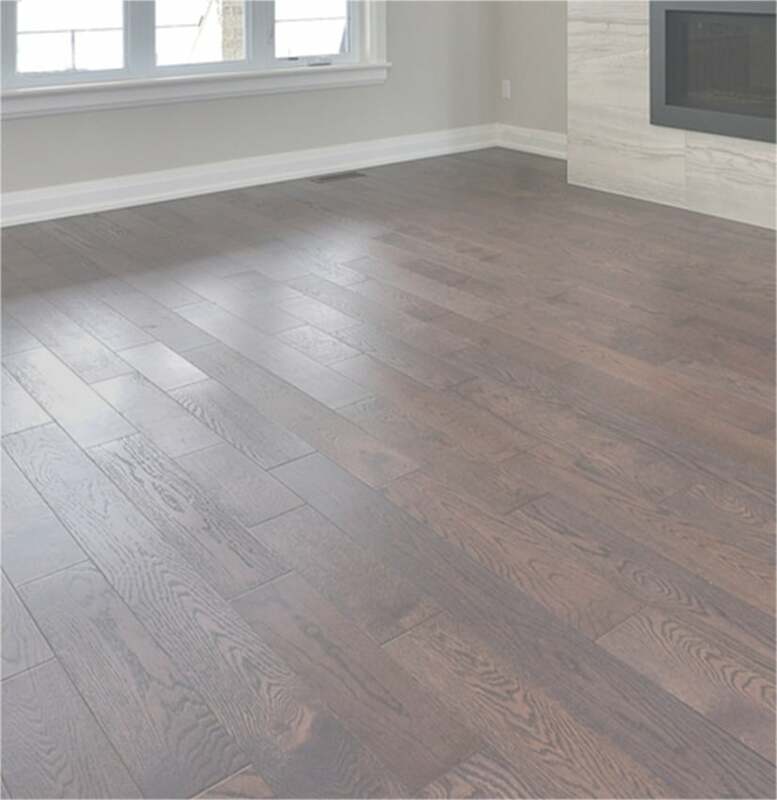 A London Ontario hardwood flooring installation project: stained solid or engineered hardwood floor in a high-ceiling space with a fireplace and bright windows. Hardwood floor installation at an office space of a gym in London Ontario. 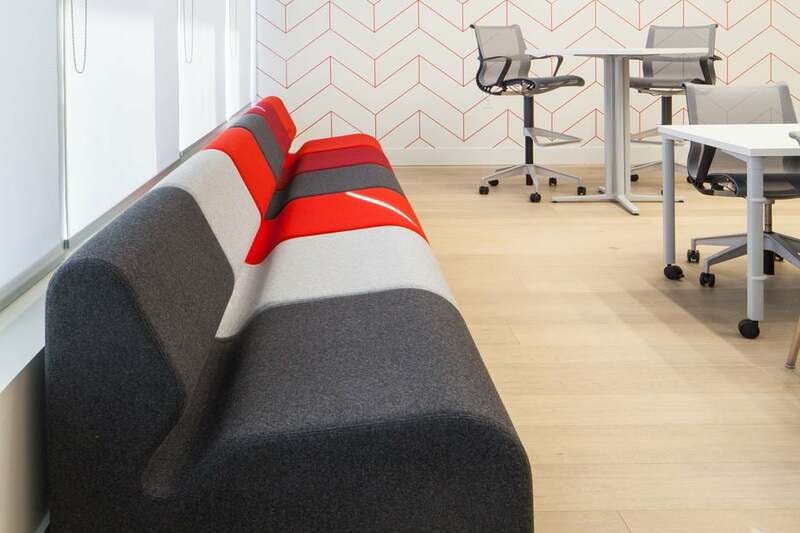 Light coloured hardwood floor, a long colourful reclining couch and tall table and chairs. 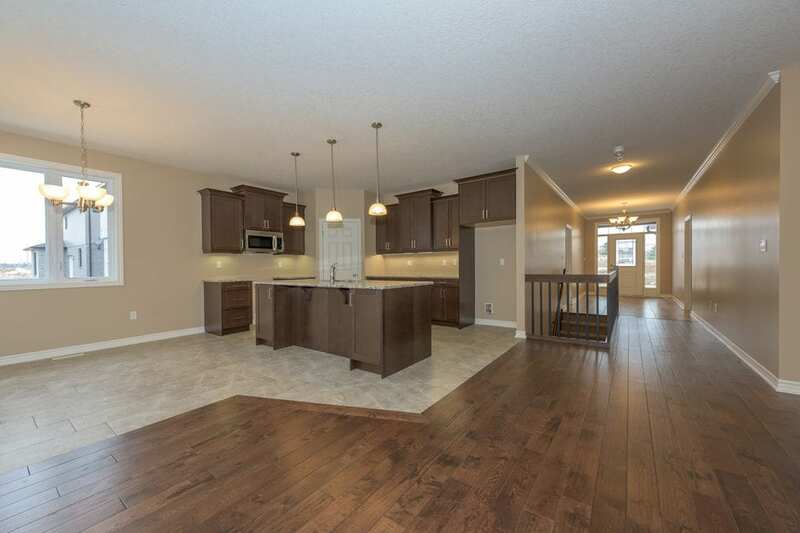 A flooring installation or wood floor refinishing project: medium dark hardwood in new kitchen with dark wood cupboards and island. 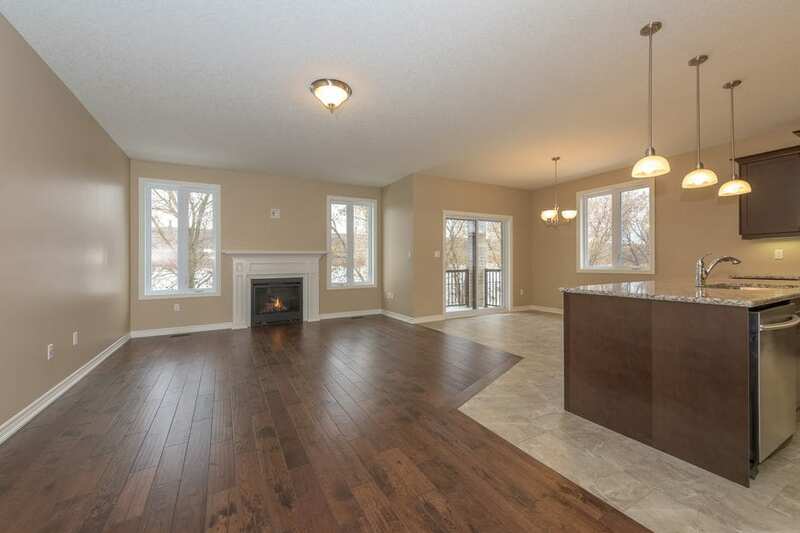 A hardwood flooring installation or wood floor refinishing project in London Ontario. 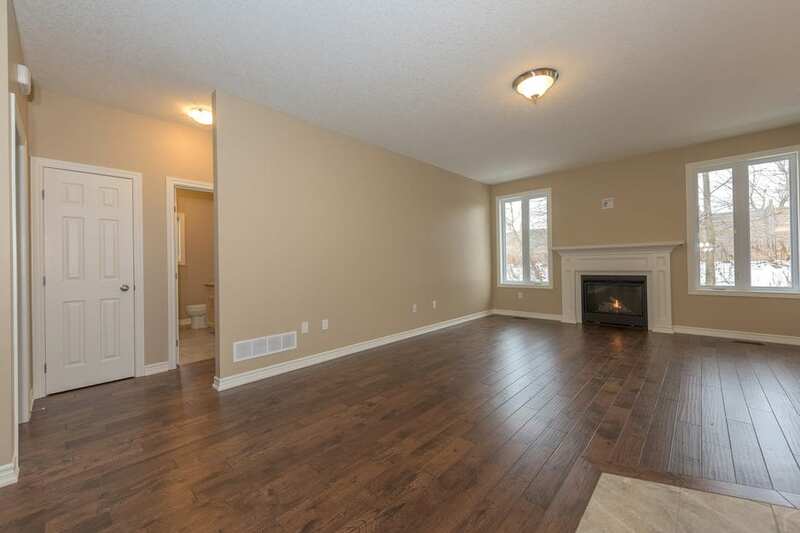 Mixed light and dark brown hardwood floors in an white-trimmed and beige-walled fireplace room. 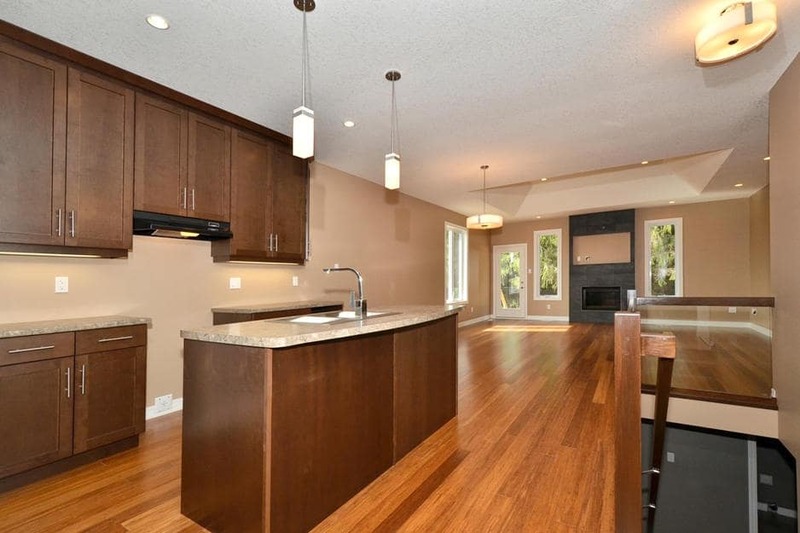 A flooring installation project: medium dark hardwood in new kitchen with dark wood cupboards and island. 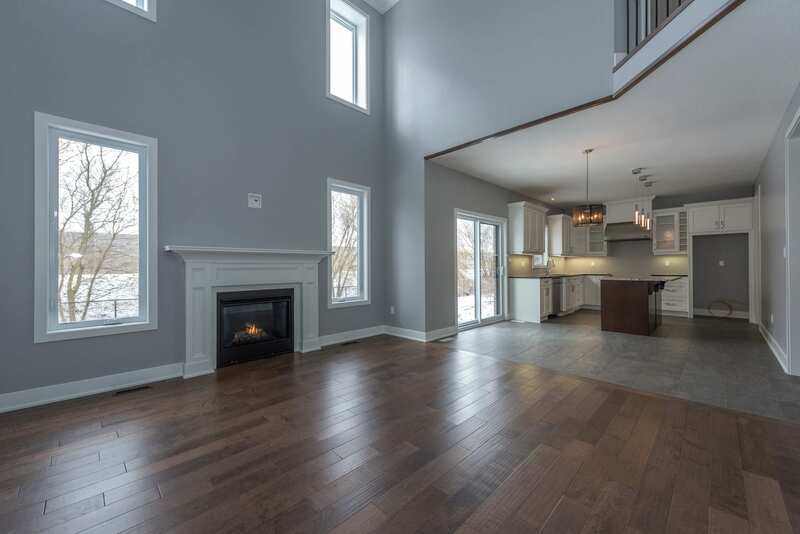 A London Ontario hardwood flooring installation project: walnut stained solid hardwood floor or engineered hardwood floor with white baseboards in a spacious open concept dining with a white fireplace.